Voting in historic elections in Pakistan concluded yesterday evening. 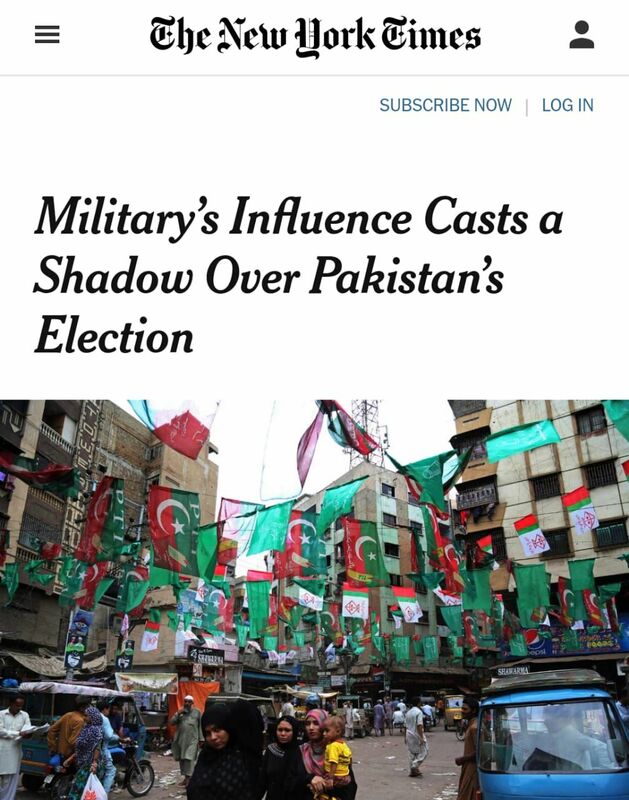 These elections were marred with several national and international controversies because the deposed Prime Minister and leader of the largest political party, Mr Nawaz Sharif of Pakistan Muslim League (Noon), was facing corruption charges. A larger bench of Supreme Court of Pakistan had already judged Mr Sharif unfit to hold the office of the Prime Minister last year and removed him. 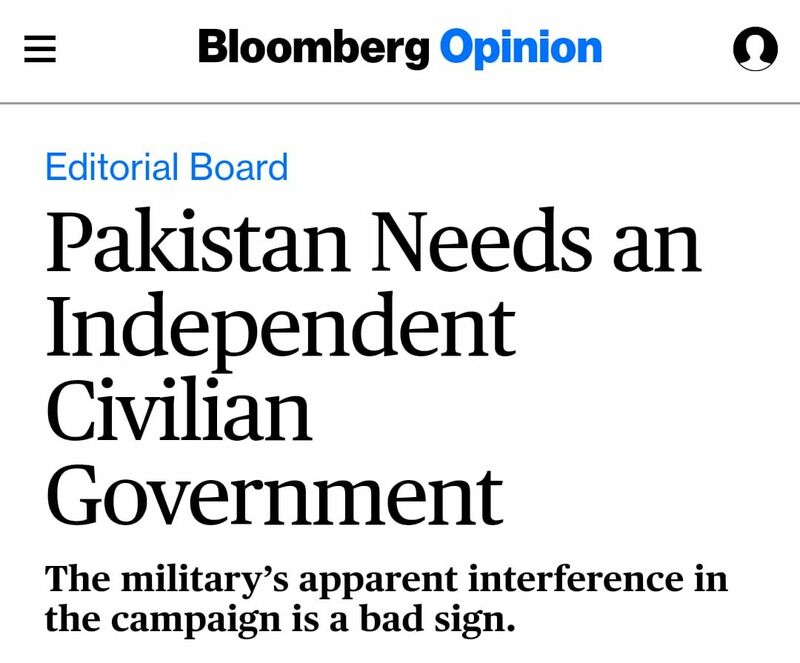 However, the disgraced PM, Mr Sharif, remained as the party leader and kept the momentum by holding rallies and publicly blaming the Courts and the Military for the “politically motivated” decision to remove him. 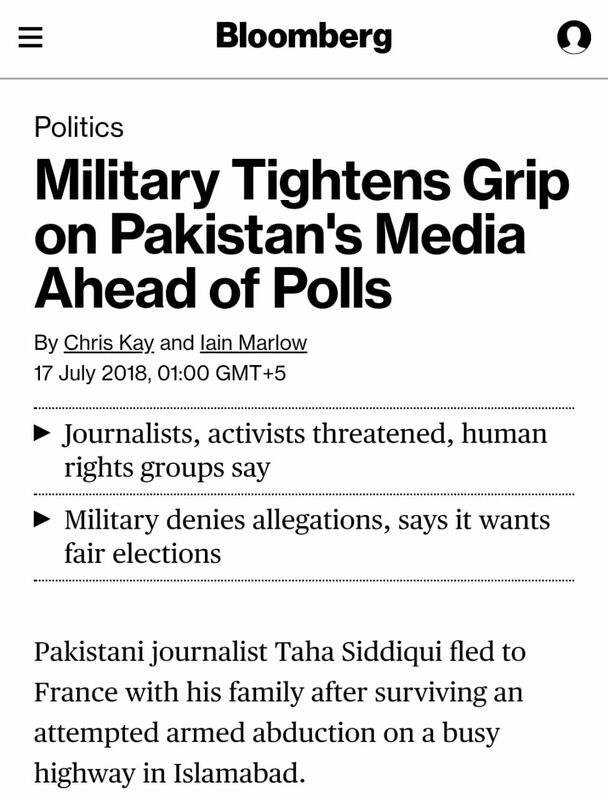 International media along with some local news channels started building the narrative that the Military was uncomfortable with the popularity of Mr Sharif and manoeuvred courts against him. However, ground reality was quite different. When Mr Sharif and his family members were named in the famous Panama Leaks, the country’s investigative agencies, military and courts did not take any notice. It was Mr Khan, Chairman of Tehreek-e-Insaaf (PTI), who took this opportunity to pressure the government to investigate the leaks and bring Sharif to justice. 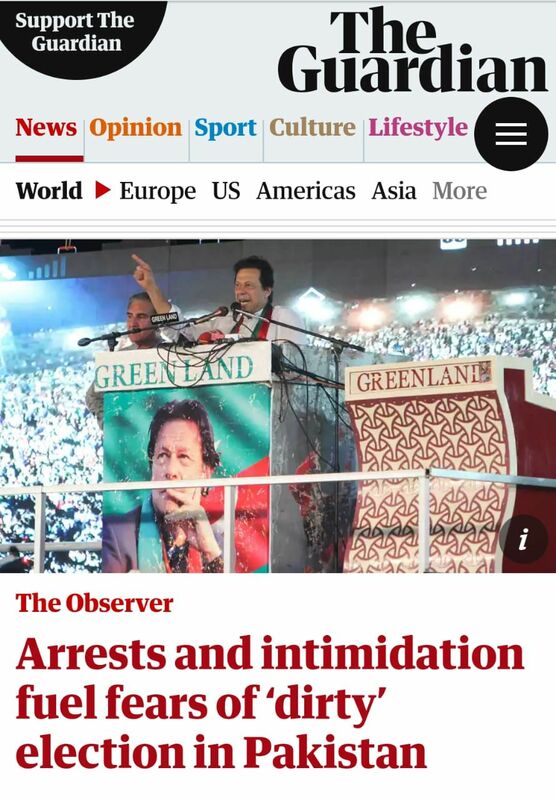 Seeing the government’s reluctance to take any action, Mr Khan staged long protests and threatened to bring the capital city of Pakistan, Islamabad, to a standstill if the courts did not move against Sharif. Had it not been for Mr Khan’s relentless pursuit, Mr Sharif would have continued to act as the PM. As a derivate of the Panama Leaks, another case of fraud against Mr Sharif and his daughter was brought for hearing in the Accountability Courts of Pakistan. Only about a week before the election date, the case was finally concluded and Mr Sharif was sentenced to 11 years in jail. 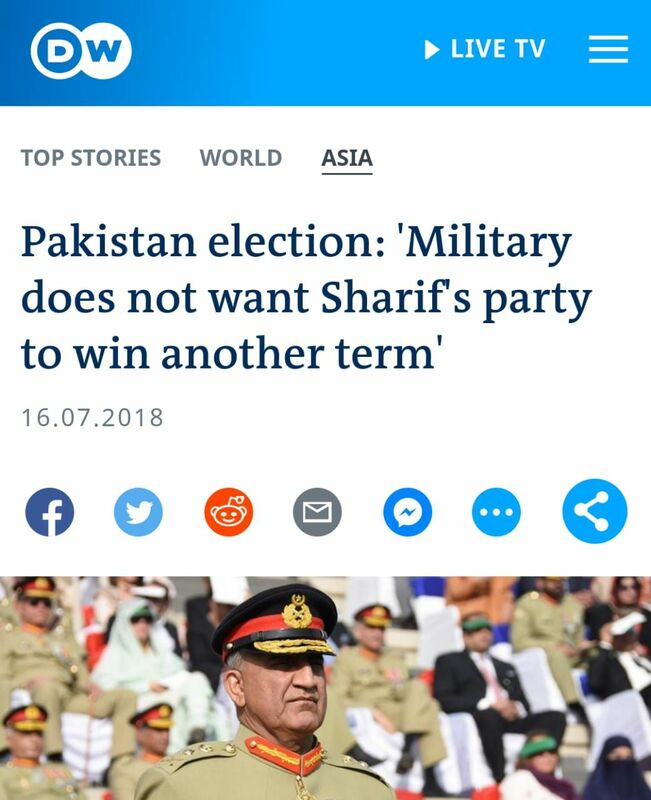 This helped further strengthen the perception that the Military was out to eliminate any chances of the PMLN forming the government for another five years. 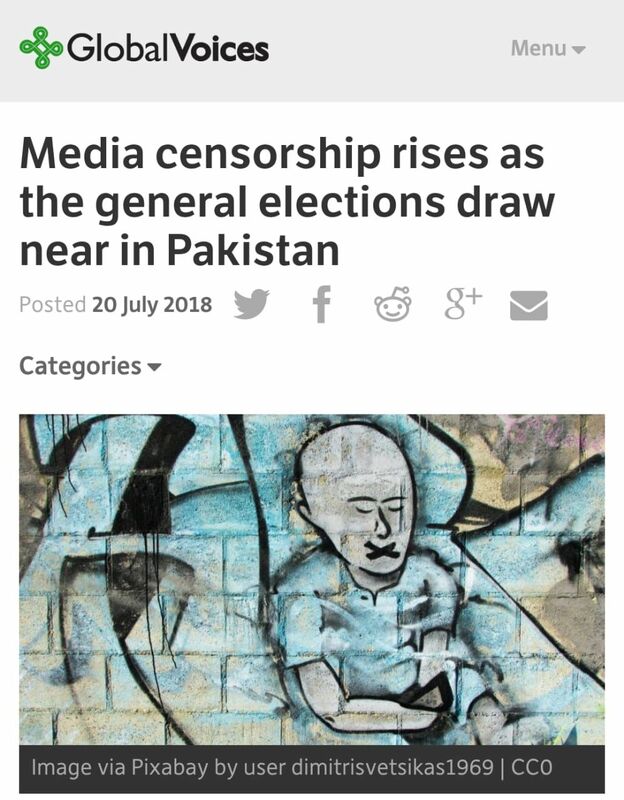 Media outlets largely driven by prominent International News groups jumped on this opportunity to taint the legitimacy of the elections. 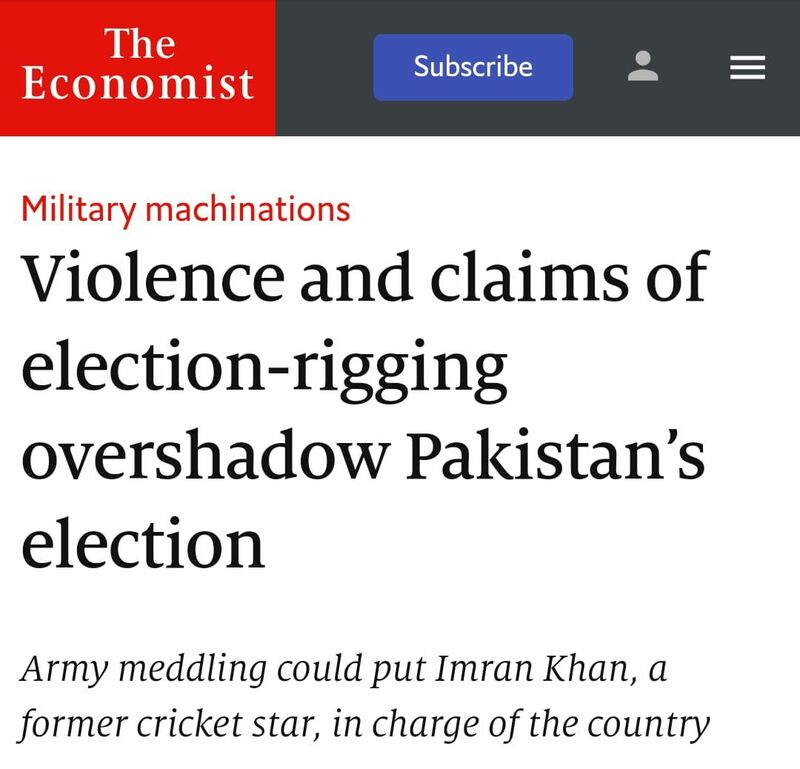 Elections were portrayed as engineered by the powerful Military and Judiciary. It appears that the underlying reason for creating this perception was to discredit Mr Khan if he emerged victorious. He is known to be a fiercely independent contender who would not toe the line dictated by the external powers. 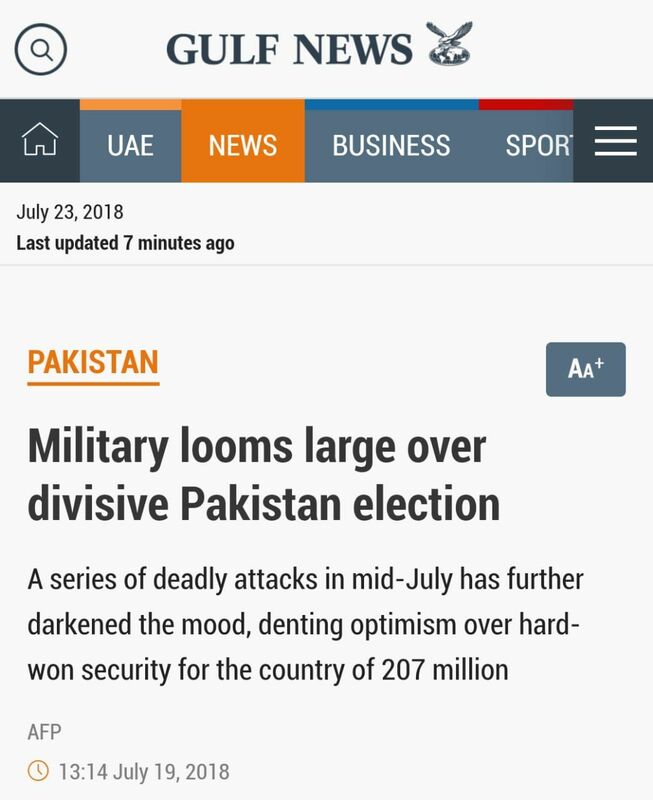 The other objective appears to tarnish the reputation of the military in the eyes of the nation, as it is the fifth largest army in the world by some accounts and is the only fully functioning institution in Pakistan. A clear pattern was visible in Gulf and western establishment media reporting before the election was even over, with remarkable consistency. 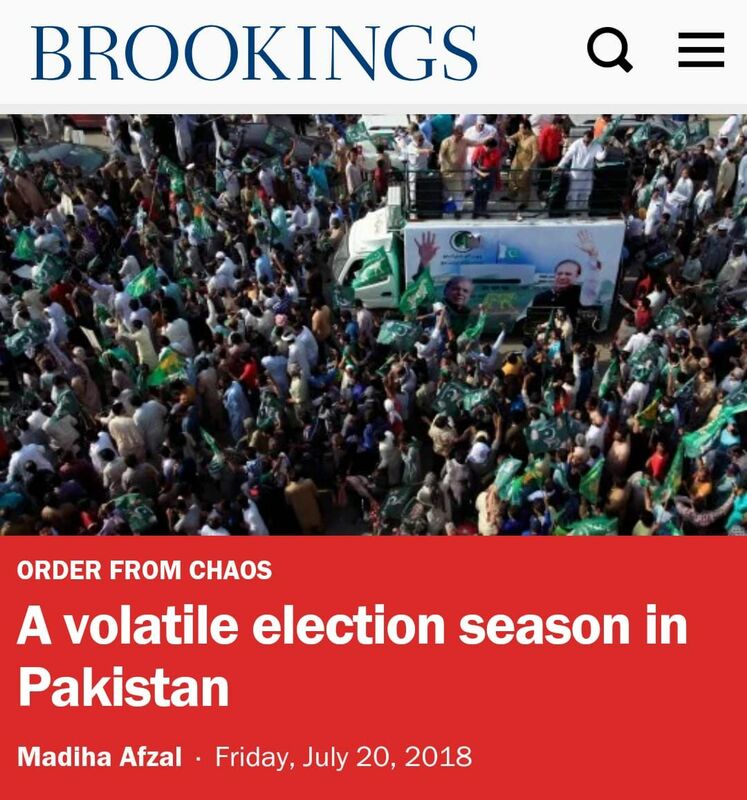 However, those familiar with the historical trajectory of elections in the country realise that although not perfect, this election appears to be far more strictly carried out than in the past. To cast back our memories, in the 2008 elections the PMLN secured only 6.8 million votes while PTI boycotted. PTI gained momentum in the next five years and emerged for the first time as a credible national party. 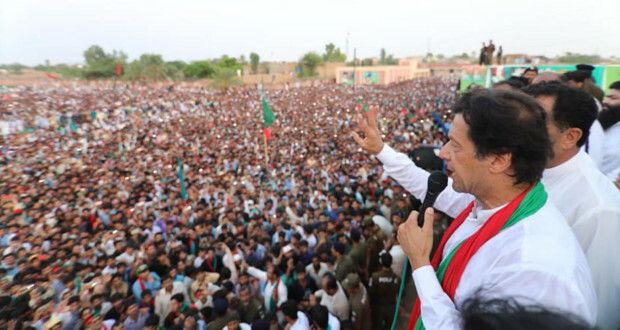 Strong attendance was observed in political rallies and it was expected that PTI would win the elections of 2013. 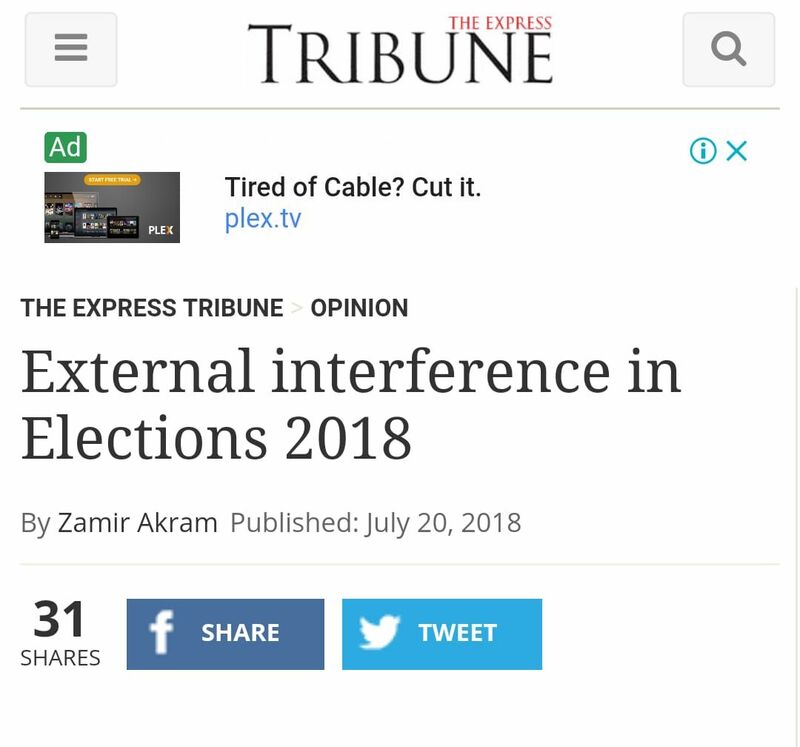 However, the ruling party, PMLN handpicked the interim government to oversee the elections. 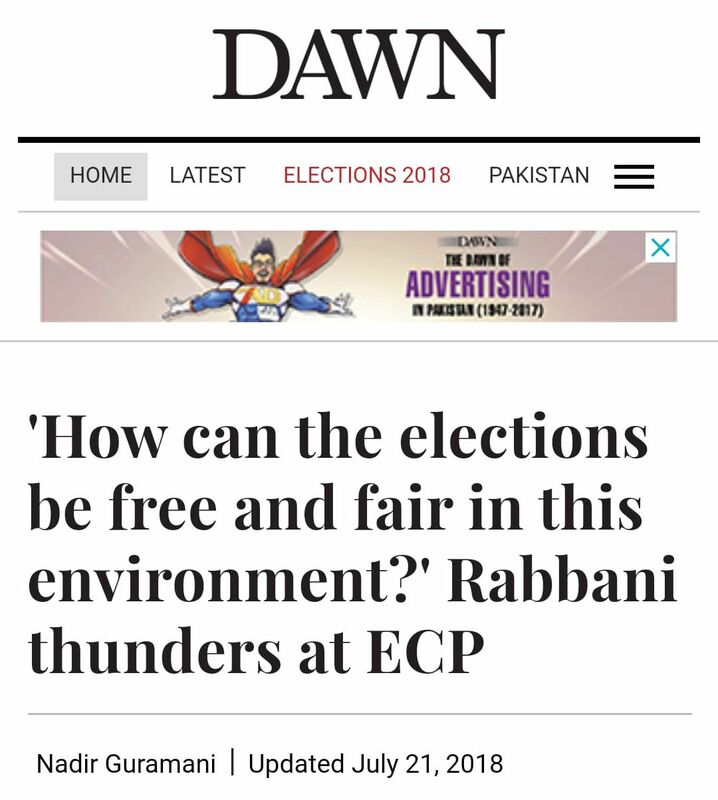 The elections results were challenged by PTI as the vote bank of PMLN shot up from 6.8Million in 2008 to 14.9 million while PTI secured only 7.7million. After much dithering, some cases were heard in courts, but no meaningful verdicts were issued. 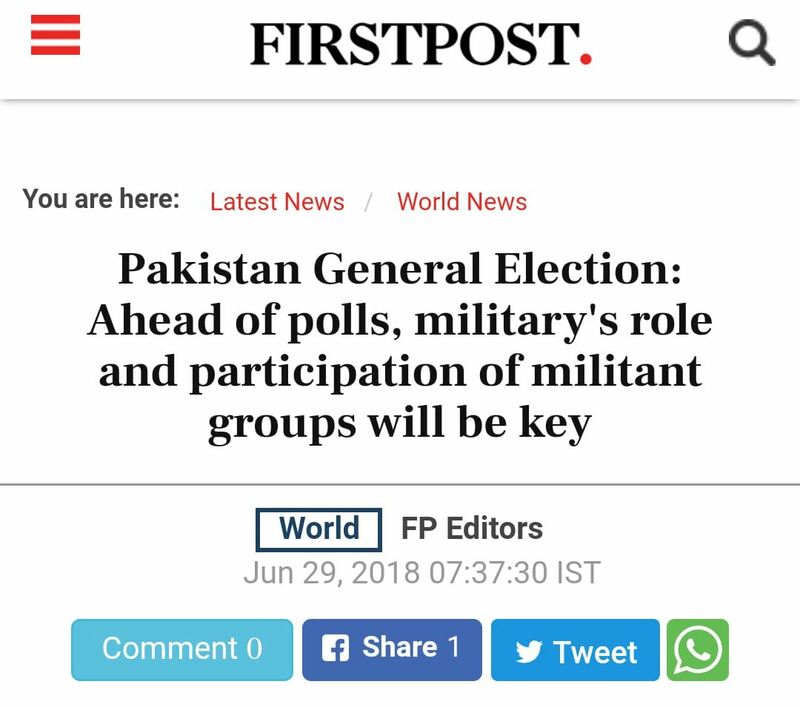 Learning from past experience, PTI was better organised this time at the grass-roots level and the army was asked to oversee the voting process to ensure transparency. Elections have largely been free and fair as reported by most local news channels. 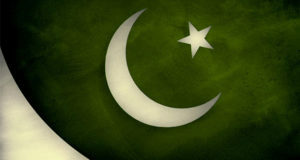 Results have largely been compiled now and are being gradually released by the Election Commission of Pakistan (ECP). Based on the results issued by ECP and those reported unofficially, Pakistan Tehreek-e-Insaaf has surged ahead of its closest rivals Pakistan Muslim League by a wide margin. Out of a total of 272 seats of National Assembly, PTI is set to emerge as the single largest party with at least 119 seats. A minimum majority requires 137 seats to form the government. PTI along with its allies and Independents is in a very comfortable position to form the Federal Government. PMLN’s tally stands at 63 seats followed by Pakistan Peoples Party (PPP) at 40. PMLN and PPP tainted with allegations and convictions of corruption are likely to join hands and form a strong Opposition in the National Assembly. PTI along with its allies will form Provincial governments in Khyber Pukhtunkhwa and Baluchistan. It is also expected that even in Punjab with 113 seats already secured, PTI may form the government there although PMLN has come out to be the single largest party with the total tally at 114 seats at this point in time. Hours ago Imran Khan addressed the nation to share his vision in a 30-minute address described as a “victory speech” by news agencies. It has been widely hailed as a momentous speech which challenged status quo and laid out future direction. It had the undertones of humility and greatness of his purpose. He assured his political rivals that there would be no victimisation and the law will be same for all. 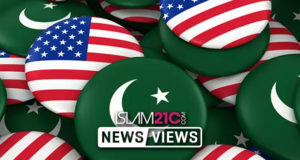 Fostering friendly relationships with arch rivals India will be his priority along with developing mutually beneficial relationship with the US rather than the “one-sided” status quo. He expressed his desire to further strengthen relationships with Pakistan’s allies, China and Saudi Arabia. Human development and economic progress, he said, will be his top priorities. He also pledged for transparency in governance and financial management to encourage the public to pay their taxes and enhance investment in the country, previously obstructed by institutional corruption. His vision, he remarked, is to create a system of welfare and fairness where there is rule of law and protection of the weakest like it was in his declared inspiration—the state of Madina under the governance of “the greatest world leader”, the Prophet Muhammad (sall Allāhu ʿalayhī wa sallam). 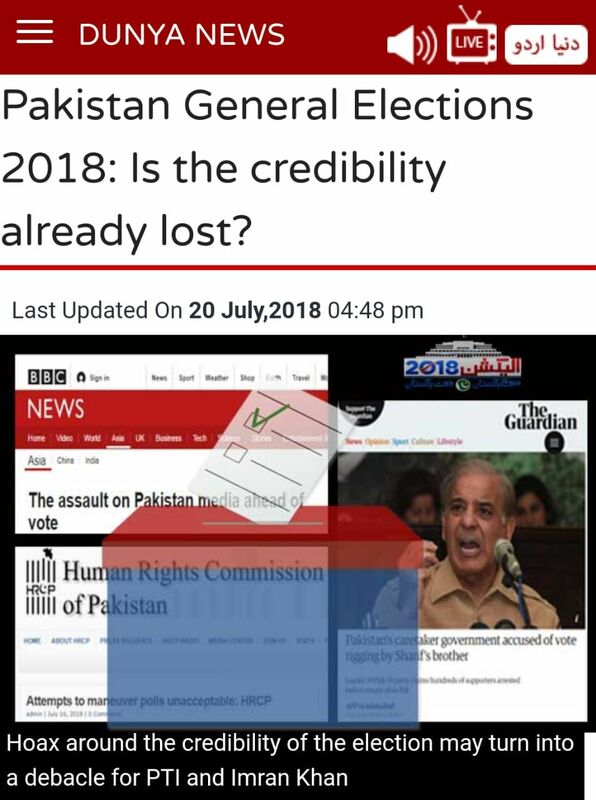 As for accusations of vote-rigging, he offered a personal promise that he will join whoever makes an accusation to call for an independent investigation, even against his own party members, adding that many accusations made today are by those who refused to support investigations in the previous elections. He ended his address beseeching listeners to make duʿā that Allāh allows him the tawfīq to carry out his ambitious pledges. After 22 years of political struggle by Mr Khan, it seems he will finally be sworn in as the Prime Minister of a nuclear-armed Pakistan. Will he be able to bring about that elusive change that he has promised and will he live up to the huge expectations of the public? Only time will tell. Click here for a shorter, translated version and transcript. Ehsan studied Engineering and holds a Masters' in Business Studies. He has worked for many years in the corporate sector and being a British Pakistani, is a keen observer of politics in Britain and Pakistan. He is passionate in his support for the political parties that he believes fight for justice and the rights of common people. He has been a keen supporter of Pakistan Tehreek e Insaaf (PTI) since its inception in Pakistan. He was born in Pakistan but moved to Britain over a decade ago.